Where? Katherine is head of online, English, at AFP. Katherine took up the position of head of online, English, at AFP in January. She was previously AFP’s bureau chief in Kabul. This entry was posted in Recommended journalists and tagged #followjourn, afp, Katherine Haddon on February 24, 2012 by Rachel Bartlett. The AFP has issued a release to say its photographer John MacDougall won the Rueckblende (flashback) award in Germany for 2011. The agency says this is the first time the award, which is for political photography and cartoons, has gone to one of its photographers. The winning picture of a German female soldier embracing a relative of one of three victims at a military funeral brought home the human aspect of the tragedy of Afghanistan, judges of the Rueckblende award for political photography said. MacDougall first started work at AFP in 1989 as a photo editor. This entry was posted in Awards, Editors' pick, Photography and tagged afp, award, Germany, John MacDougall, Rueckblende on January 27, 2012 by Rachel Bartlett. Russian media outlets and the Committee to Protect Journalists have called on President Medvedev to deal with unsolved crimes against the media, following an attack on reporter Oleg Kashin this weekend which led to him being placed into an induced coma. According to a report by AFP, 26 reporters and media outlets, as well as hundreds of others, have signed an open letter demanding protection for journalists’ rights. We are outraged by the attack on Kommersant reporter Oleg Kashin. While it is important that President Medvedev has called for the perpetrators to be ‘found and punished,’ we also believe that the government itself has considerable responsibility. By failing to prosecute those who have carried out crimes against journalists in the past – including 19 murders committed in the Putin era – the Russian government has created a climate of impunity. Government statements and expressions of sympathy are simply not sufficient. Arrests, prosecutions and convictions are what are urgently needed. This entry was posted in Editors' pick, Press freedom and ethics and tagged afp, attack, Committee to Protect Journalists, Oleg Kashin, press freedom, Russia on November 8, 2010 by Rachel Bartlett. The AFP this morning reported that a radio journalist has been shot dead in the northern Philippines, the second killing of a journalist this week. The press men, killed in separate attacks at opposite ends of the country within the space of 24 hours, were both outspoken radio broadcasters known for their criticism of corrupt local officials. The AFP reports that 33 journalists were killed in the Philippines last year, according to the Committee to Protect Journalists (CPJ). More than 100 have been killed since President Gloria Arroyo came to power in 2001, according to the National Union of Journalists of the Philippines. This entry was posted in Editors' pick, Journalism, Press freedom and ethics and tagged afp, cpj, Philippines on June 16, 2010 by Judith Townend. Fast Company takes a look at the legal row between news agency AFP and photographer Daniel Morel – and where Twitter fits in. In summary, AFP is currently embroiled in a rights row with Morel after using photographs of Haiti that had been uploaded on Twitpic. Morel reportedly sent cease-and-desist letters to which AFP responded with threat of a law suit. AFP, like a lot of more established organizations, seems unable to change their perspectives on Twitter to address what the service actually is. That Morel posted some of the most important photos of the decade on Twitter before any other publication shows the power and flexibility of Twitter as a legitimate news service. AFP’s argument, that Twitter is in some way nothing more than a digital bulletin board with no accompanying rights, is worrisome – it’s a different kind of news outlet than AFP, but that doesn’t mean its value in news can simply be ignored. This entry was posted in Journalism, Photography, Social media and blogging and tagged afp, daniel morel, Photography on May 11, 2010 by Judith Townend. The Frontline Blog ran this post yesterday, updating as news broke. The AFP reports that, according to the Somali defence minister, the pair were ‘kidnapped for cash not politics’. 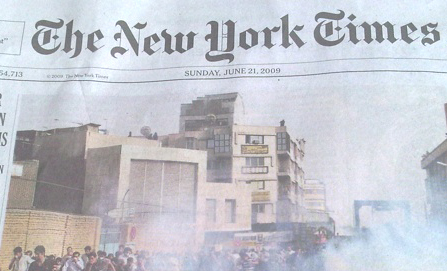 This entry was posted in Editors' pick, Press freedom and ethics and tagged afp, Amanda Lindhout, Colin Freeman, defence minister, driver, Frontline Club, Jose Cendon, Mogadishu, Nigel Brennan, photographer, Somalia, the Telegraph, The Washington Post, Washington Post on July 15, 2009 by Judith Townend. 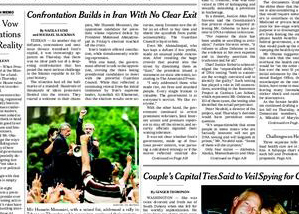 Further to our round-up of Demotix activity from Iran, here are two front pages from the New York Times, both featuring images from the pro-am agency’s contributors. Demotix images have also been published by the Telegraph, El Pais, Wall Street Journal, ABC.es, and syndicated by Reuters, AFP and EPA to other outlets around the world. This entry was posted in Citizen journalism, Editors' pick, Online Journalism, Photography and tagged ABC, afp, Andy Heath, commissioning editor, Demotix, El Pais, Environmental Protection Agency, Iran, iran elections, Islamic Republic of Iran, New York Times, reuters, the New York Times, the Telegraph, Wall Street Journal on June 22, 2009 by Judith Townend. Agreement will allow the agencies to market their video footage in English. Agencies already partner on images. This entry was posted in Media releases, Multimedia, Photography and tagged afp, getty, Video on April 2, 2009 by Laura Oliver.